Alcatel is best known brand in United States for making low quality and budget friendly smartphones. After announcing a number of handsets at Mobile World Congress 2012, it is ready to go with an Android tablet in the market. Probably, the low priced Google Nexus 7 and Kindle Fire sales growth and sales inspired the Alcatel to enter into the tablet manufacturing unit. 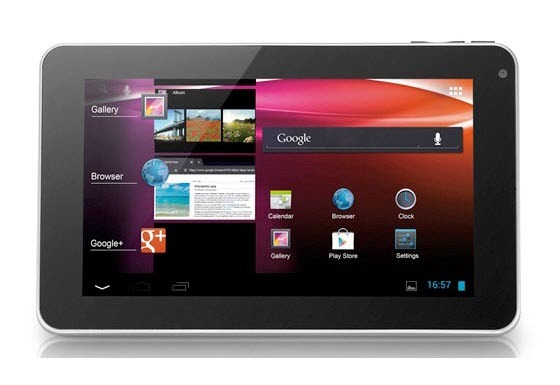 Recently, it has announced the new tablet dubbed as One Touch T10 in the market. Alcatel One Touch T10 is a 7 inch tablet which runs on Android 4.0 Ice Cream Sandwich operating system as the Google’s latest OS on the device and you will be happy to enjoy the stock android ICS OS on the device as there is no customization done by Alcatel. It is powered by 1 GHz Rockchip RK2918 ARM Cortex-A8 single-core processor and includes 1 GB of RAM, 4 GB of internal storage expandable by 32 GB via a microSD slot. The screen provides a maximum resolution of 800 x 480 pixels and it includes the 0.3-megapixel front-facing camera which can be used for face to face video chat and hangouts at Google+. The Alcatel One Touch T10 tablet weighs 12 ounces and it has Wi Fi internet connectivity with micro USB port, mini HDMI port, headphone jack connectivity options. In the promotional photos you can see an icon for the Google Play Store and Google Maps, which suggests that this is a Google Certified device. Compared with other low price tablets it has one better advantage yes, its ability to have the Google Play Store access allowing the users to install, download and run thousands of Android applications for free and paid download as well which consists of widgets, games, software’s and tools. As of now, this tablet is sold for 120 Euros in United Kingdom and when it arrives in United States, it will be under $ 150 or less. In the market you can find a tablet possessing the same specifications at less than $100 as well. If they are priced in the same range, then they are sure to find a niche but it would be hard for them to continue. There is one common question to everyone, while other companies such as Google, Amazon, Samsung, HTC offer better specialization tablets with dramatically lower price, it is not clear what Alcatel is trying to do here.